Even with the rise in different social media platforms, Facebook is still a leader in the industry. With everybody you know and follow posting on Facebook constantly, your feed can be cluttered at times. As a digital marketing company, we spend quite a bit of time on Facebook managing our clients’ social media, engaging with followers, finding relevant content, or creating Facebook ads. We need to be efficient just like you. Luckily, Facebook has ways to help cut through the chaos and optimize our time. Let’s check out how you can do just that! There are usually people and pages that are more interesting and valuable to you than others. By prioritizing the more important people and pages to you, Facebook will place their posts ahead of everyone else on your timeline. This will allow you to utilize your time better because you won’t have to sift through unnecessary posts to get to the ones you want to see. There are some people who feel the need to post every little thought that creeps up into their brain. To save yourself some time, you have the option to unfollow those people. Facebook has a very advanced algorithm so it could benefit you to check out the Discover Pages tab every once in a while. You might find a prospect or somebody you can collaborate with because it matches you with people and pages that match your same interests. If another person or firm is very exceptionally influential to your company, it is a good idea to get notified every time they post something on Facebook. It could mean all the difference being updated at the moment rather than finding something out a few days later that could potentially alter your business. 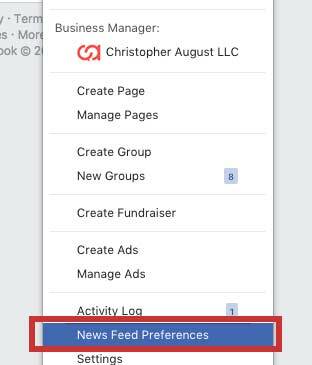 To do this you need to go to the page of the person or business that you want notifications for and place your mouse over the “Following” tab. Then click on the icon with the pen next to “Notifications.” Then you can alter your notification settings for their posts, events, and/or live videos. Facebook gives you the opportunity to add your own touch to their algorithm. You can choose for Facebook to stop showing you posts that you don’t have interests in. When a post type of post that you don’t want to have to see again comes up on your timeline, click the downward arrow in the top-right corner of the particular post and options will appear. Choose one of the three options. This works for ads too! Facebook videos are becoming increasingly more important because statistics say they are the most engaged with posts. Adjusting your settings for videos enhances your entire Facebook experience. The options to choose from include stopping auto-play, default quality, customizing caption display and showing captions entirely. To change these settings, click on the downward arrow in the top right corner of the page and choose “Settings.” Then choose “Videos” on the bottom of the side bar and make your changes. In the world of marketing, your time is as valuable as anything else. If you are using your time wisely, you can get ahead of your competition. Just because you are working hard does not mean you are working smart. When hard work meets smart work, the value brought to the table is apparent. Hopefully, this helps your marketing efforts. If you are finding that no matter what you do, you are always running out of time, you can call or message us for help!